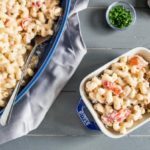 This Truffle Lobster Mac n' Cheese is filled with succulent chunks of lobster meat, packed with three decadent cheeses and drizzled with smooth, pungent truffle oil. This is the perfect dish for when you want to indulge and eat like a king or queen! Meanwhile, melt butter in a large saucepan over medium heat. Add the shallots and cool until translucent, about 3 minutes. Add in the garlic and cook until fragrant, an additional 30 seconds. Sprinkle the flour over the vegetables and whisk to coat. Add in the cayenne, mustard powder, nutmeg, salt and pepper. Cook, whisking constantly for 3 minutes. Add in the milk, heavy cream and bay leaf. Increase heat to medium high and bring to a gentle simmer, whisking frequently. Reduce heat to maintain simmer and cook until the sauce thickens, about 8-10 minutes, stirring occasionally. Remove bay leaf and discard. Reduce heat to low and stir in mascarpone until well incorporated. Add in the gruyere and fontina cheese, stir until melted. Stir in the pasta and ½ cup reserved pasta water. Gently fold in the lobster meat. Add more pasta water, ½ cup at a time if thinner consistency is desired. Taste and adjust for seasoning. Drizzle with Truffle oil or serve on the side. Enjoy!